Mrs. Hufnagel is discharged from St. Eligius, but suffers a great loss along the way. lay a hand on her. 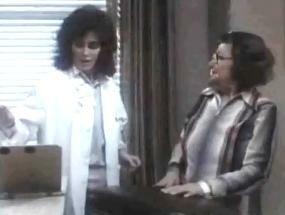 "Bye, George" features the most of Mrs. Hufnagel we've seen in any one episode so far. For the first time, we see that maybe there's a vulnerable, caring person in there somewhere after all. Once again, Mrs. Hufnagel (Florence Halop) has been passed to another doctor. This time, attending physician Dr. Annie Cavanero (Cynthia Sikes) gets the nod, having taken over the case from Dr. Jack Morrison (David Morse), who can no longer see patients since it was revealed that he had fast-tracked his education and was not qualified to practice medicine. Fortunately for Annie, Mrs. Hufnagel's treatment for phlebitis has ended. She asks Annie about her decision to propose to her new love, Murray Robbin (Murray Rubin). The rumors about Cavanero that Hufnagel refers to involve visiting surgeon Dr. Christine Holtz (Caroline McWilliams), who became fast friends with Annie and stayed at her home, but then Annie became uncomfortable when she found out that Holtz was a lesbian. Rumors flew that relations between the two were more than platonic. I enjoy the shout out to Miami Vice, which had just debuted a few months earlier. Mrs. Hufnagel's proposal to Murray doesn't work out as she had hoped, as Murray is not ready to be tied down. Meanwhile, Dr. Elliott Axelrod (Stephen Furst) has asked Murray to teach him how to tell jokes. Sadly, their first lesson is cut short when Murray's pratfall turns out to be a fatal heart attack. Elliott now must tell Mrs. Hufnagel the terrible news. Axelrod, the sensitive son of a callous veterinarian (he'll be played by Louis Nye), can't bring himself to tell her, as he is reminded of the childhood trauma of losing his dog to a passing car and having to bury it. 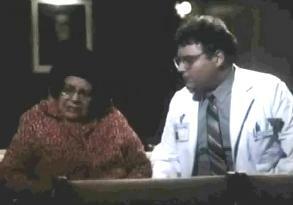 According to Edward Copeland, their scene in the chapel is Stephen Furst's personal favorite. You'd think that Murray's story would be over, but two seasons later, we find out what happened to Murray once he departed this earthly realm. In "After Life", we learn, courtesy of Dr. Wayne Fiscus (Howie Mandel), that Murray had unfinished business, and as a result, his spirit was still languishing in purgatory, alongside fellow former St. Eligius patient Rockin' Ralph (Richard Marcus), a.k.a. the Birdman of St. Eligius, who had been there since season one. Murray hadn't yet achieved his dream of making people laugh. By the end of Wayne's time there, Murray manages to get a chuckle out of him. If you haven't seen St. Elsewhere before, I understand if this sounds strange. And I'm surprised that you read this far.